We can’t say that the weather isn’t on our side – when not deploying GPS loggers, that is. Another stunner of a spring day and according to the weather man, the West Coast is the warmest place in New Zealand today. We decided to have a look at Jackson Head’s eastern side. So far, we have been working on the western shores of the peninsula, where the coast faces the open sea. The eastern shores look at Jackson Bay and the alpine ranges on the horizon. It is on this side that almost 40 years ago John Warham from Canterbury University did the first comprehensive study of tawaki breeding behaviour. I’m not sure if anyone has visited those penguin colonies since. Low tide was conveniently just after lunchtime so that we could walk round the foreshore to look for these penguin colonies. We had no idea where they were located, but penguin calls told us where we had to dive into the bush to find them. I was particularly curious to see if the colonies on this side of Jackson Head also show signs of predator impacts. If anything, I would think that this part of the peninsula is easier to access for stoats and possums. The vegetation proved to be even nastier than on the western slopes. Besides kiekie that tries to slice open every exposed part of skin with its blade like leaves, the bush is thick with supplejack vines, perfect to get entangled in, unless you’re penguin size of course. The first small tawaki colony comprised of just four nests that are tucked away in the roots of an old fallen tree. When I say four nests, I actually mean to active nests and two nests that might have been active. In one nest a single male penguin guarded an empty hollow, and one floor up, a pair of tawaki huddled around another empty nest bowl. As neither eggs or chicks were in sight this could mean that they were non-breeders – or that the nest contents were taken by predators. I suspect it’s more the latter. The further we got towards the point of Jackson Head, signs of undisturbed breeding became more prominent. Eggs that rolled out of nests, dead chicks that rolled out of the nests and died which is normal in crested penguins where usually only the first-born chick survives. And as morbid as that may sound… this is good because it means that no possum or stoat has been around to scavenge – or kill chicks. So it seems, that predators may indeed be a problem for the penguins over on this side as well. 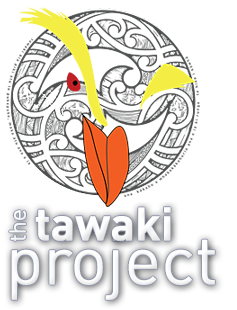 But there are tawaki sub-colonies that are not – yet – affected by it. As the sun started to set on the other side of Jackson Head we made our way back to Jackson Bay. Bottlenose dolphins zoomed past and tawaki started to show up to get back to their nests. The further we got towards the point of Jackson Head, signs of undisturbed breeding became more prominent. Eggs that rolled out of nests, dead chicks that rolled out of the nests and died which is normal in crested penguins where usually only the first-born chick survives. And as morbid as that may sound… this is good because it means that no possum or stoat has been around to scavange – or kill chicks. So it seems, that predators may indeed be a problem for the penguins over on this side as well. But there are tawaki subcolonies that are not – yet – affected by it. As planned we went out late last night to deploy GPS dive loggers on female tawaki. And as forecasted it started pouring down about two hours before we left our research base in Neils Beach. Despite getting wet to the bone, we managed to fit two devices to penguins. Now let’s hope the tape we use to attach the devices holds. Applying it in such wet conditions is always a bit iffy. But I consider this a good start. Because we returned around 2am we took it easy this morning. Tonight, high tide is going to be around 9pm. With the current swell that hits the coast this means that we can’t get in or out of the penguin breeding areas between 6pm and midnight. So no logger deployments tonight. This is why we hoped to find any volunteering penguins in the afternoon. By lunchtime, the weather had cleared up once again – welcome to the West Coast, or indeed, New Zealand. We prepared three more logger packs and headed out to Jackson Head. But, alas, no females anywhere in sight. So no loggers out today. But on our search for females, we made a worrying discovery. Three of our 30 monitored nests have failed already. In a bad year, that can happen. But firstly all the environmental signals point to this being a good year for the penguins, and secondly the nests were all empty. No trace of eggs or chicks. 50 metres below the ‘apartment building’ we found a penguin egg with obvious bite marks. So either, the egg was scavenged by a possum after it had rolled out of the nest. Or we may have a stoat problem again. We decided to keep a close eye on what is happening at Jackson Head. So we have abandoned our plan to go to Milford Sound tomorrow and will instead check all breeding area for signs of another stoat invasion. We arrived at Neils Beach, the small settlement about 5 km from Jackson Head late yesterday after witnessing substantial flooding along the Jackson Bay Road. The weather over here was really bad the past few days. I think our 24 hours delay for our departure was a good call. Indeed it was, as today the West Coast enjoys beautiful blue skies and sunshine. Perfect conditions to go out and get cracking with our work. Just after lunch we made our way out to the penguin breeding areas with the intention to deploy a few more nest cameras and to fit the first GPS dive loggers on chick feeding female tawaki. As could be expected, we found mainly male penguins guarding their small chicks or incubating eggs that should hatch very soon. On a couple of nests we found pairs, where the females had returned early to feed their young. Access to these nests was difficult, so that we did not bother these birds to stick devices on the females. Later afternoon, early evening seens most of the females return to feed their chicks, so that that time of the day is much better for what we want to do. Unfortunately, the tide was not on our side. High tide was at 8pm. This combined with the fact that there was a considerable swell hitting Jackson Head meant that we could not get in or out of the penguin breeding areas between 5pm and 11pm. So it will be another nightshift for us. We’ll head out around 10.30pm tonight. Hopefully we will manage to bring out three devices. Problem is, that the weather forecast predicts rain for tonight. Hard to imagine when you look at the blue skies that stretch over the West Coast at the moment. Then again, this is the West Coast. So we better brace ourselves for a wet evening.